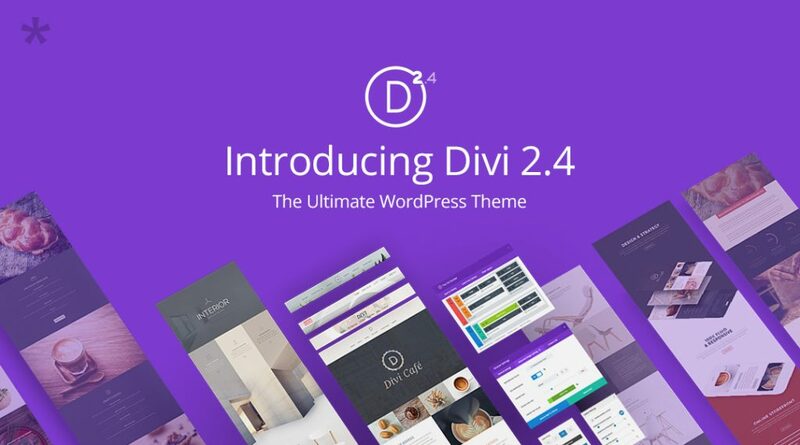 In April, 2015, Nick Roach from Elegant Themes announced the new Divi theme – Divi 2.4. In his article published on Elegant Themes website he emphasized some of the features on why this WordPress theme will be one of the most flexible and customizable WordPress themes ever made. The Divi 2.4 is now finished so I decided to do a little review and analysis of the features that will help you decide whether this theme is worth switching to it or using it as your new WordPress theme. As 5+ years WordPress user I have used various different themes. Some of them were bad, some of there were, and still are, exceptionally good. However, Divi 2.4 is something different. The theme is astonishingly adoptable and extremely easy to customize. Right from the General Theme Settings you can do so much with your website settings. Here is where you will define or change all of the widths and text styles. With few simple clicks Divi 2.4 enabled me to define the theme gutter, website content, sidebar widths and to define the control section and row padding. You can easily define the header text and body text styles from the general theme settings as well. There are 10 column layouts. After you choose your preferred column layouts with Divi 2.4 you can do additional customization of lets say footer widget header styles, body text styles, social media link styles etc. Divi 2.4 creators also thought of a way for you to determine the design of your website for the mobile devices. Mobile friendly website is a must nowadays and the possibility to design and change the styles of your mobile website without doing any coding is a neat touch. Thus, with Divi 2.4 you will be also able to determine or change the section and row height, body text size, header text size, mobile header background color and mobile header text color. Divi 2.4 totally fulfilled my expectations when I noticed that it enables you to do changes of the text sizes, styles, background color, border styles, radius, button icon placement and hover styles. We all know how crucially important is this. With a simple click in the global button styles I was able to change the background color and the border styles in no time. With the custom spacing controls you will be able to control basically everything on your WordPress website. The global and invididual section and row padding, the module margins and padding, the row column spacing and row width and the content/sidebar width are able for customization in this part of the Divi 2.4. Some of the features that you will be able to use in order to design your posts are to show/hide your page tittle/meta/featured image. Also it is important to emphasize that the New Post Title Module places the page title/meta/featured image withing a page builder layout. You will also be able to change the full width or the sidebar layouts. One of the features I loved the most in the new theme is the Divi Library. This was something that was needed for so long time, and something that was also announced by Nick in his post. I must say that this gives a great customizable note to the theme, something that will be appreciated by its users. You will be able to build a website extremely fast with the astonishing divi library. There are stored saved layouts, sections, rows and modules. The thing is that you can create and edit everything from the divi library. Whether we are talking about sections, rows, modules, elements, you will have control over everything from within the library. You can also import/export anything from the library for use on other installs, which is exceptionally useful feature. The best thing is that you can make any library element global and it can apply to anything. That also means that you can save and update on section/row/module and add it into any number of layouts, or when you update one element you can update them all. So, the Divi Library will not only give you great control and editing possibilities, but it will also save you a lot of time. I have already built one test website and tested all of the features of Divi 2.4. All stated features in this review work flawlessly. You will definitely have greater control when compared to other themes. The flexibility and the customization are amazing. I know that using Divi 2.4 will save me great amount of time, plus with the full screen module I really feel like I can create some new unique website. The Divi Library is also an amazing addition that will give you outstanding control over your websites. At the end of the day I really feel like Divi 2.4 is one of the best new WordPress themes, definitely worth trying! (Disclosure: this is a sponsored review by Elegant Themes. However, everything I said is based on testing out the new theme and sharing my experience).